The Municipality of the resort city of Viña del Mar has valued at 3 billion Chilean pesos (about US$ 4.3 million) the losses left by the huge swells that in the last months have battered the beaches of this tourist city. The waterfront, which had recently been renovated because of the same problems, again suffered great destruction, forcing to stop works that were scheduled for the coming months. For this reason, a US$ 2.2 million recovery plan, which is not definitive but aims to repair the recent damages, was announced. The most affected places by the magnitude of the harms, where will be carried out the next works are Paseo Wheelwright and Paseo Juan de Saavedra in the neighboring seaport of Valparaiso and La Marina Avenue in Vina del Mar. The emergency works will include tasks to increase security in the area, removal of the affected materials, construction of riprap and retaining walls, as well as new sidewalks, to recover coastal infrastructure and leave it as it was before tidal waves. In parallel, comprehensive studies are conducted to determine the new behavior of the tides and how its effect can be faced in the best way. 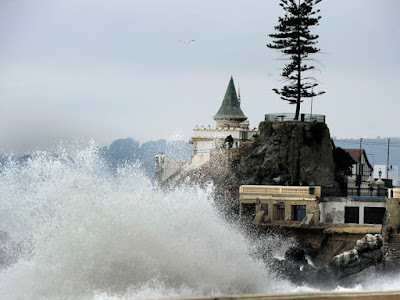 Decades ago, large swells were common only at specific times of the year but for some time now the phenomenon became much more common and intense even affecting not only the city of Vina del Mar but also various regions of the country. All these abnormal events are attributable to climate change, this year increased with the El Niño phenomenon and it is feared that, if the trend continues, the coming years will present a greater amount of large surges. By 2015 there was a record of 45 events and 2016 has kept the average. On the other hand, there have been accidents, even deaths, by the carelessness of the people. So the authorities again called on people to not be reckless and follow established safety standards, avoiding transit through rocky areas and beaches not enabled for bathing. It is also prohibited water activities without authorization.